When Eugenides (yoo-JEN-ə-deez), the Thief of Eddis, stole Hamiathes’s Gift, the Queen of Attolia lost more than a mythical relic. She lost face. Everyone knew that Eugenides had outwitted and escaped her. To restore her reputation and reassert her power, the Queen of Attolia will go to any length and accept any help that is offered…she will risk her country to execute the perfect revenge. They told me the real fun in The Queen’s Thief series starts with the second book. I wasn’t sure what to expect when I opened my copy of The Queen of Attolia, except that it’s not told in Eugenides’ point of view anymore. I was ready for that, but I wasn’t ready for the changes coming to Gen and the kingdoms he moves in. Spoiler warning for The Thief from this point onward. At the end of the first book, we find out that Eugenides is not just a simple thief, but the Thief of Eddis. After stealing Hamiathes’ Gift under the Queen of Attolia’s nose and escaping her clutches, the Queen was out for his blood. It didn’t help that Eugenides kept on taunting her by sneaking into her palace. When Eugenides is finally caught, the Queen carries out her revenge which starts a series of events that would change the kingdoms of Attolia, Eddis and Sounis. I thought I would miss Eugenides’ voice here since he’s not the narrator anymore, but I was wrong. Eugenides was still as snarky, stubborn and cocky as ever, but he also starts growing up in this novel. I couldn’t blame him after what he goes through in the first part of the novel. Then I appreciated the third person switching point of views because it made me understand the story more. It was interesting to be inside the Queens of Eddis and Attolia’s minds in addition to Eugenides’. It shows how good Megan Whalen Turner’s world and character building is. 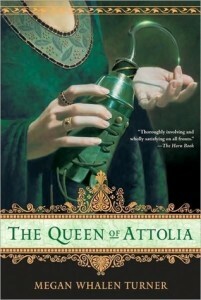 The Queen of Attolia is really one part fantasy and two parts political intrigue. The magical aspect doesn’t really show up until some time around the end. There were more talks of war and politics between queens and kingdoms, almost akin to how the latter part of the story was in Fire by Kristin Cashore. This makes the story unfurl a bit slowly just like how the previous book was, but I think the highlight of the book isn’t really the plot but the character development, specifically Eugenides’. His transition from the cocky young thief to a beaten-up, almost despairing and darker one was interesting and sometimes heartbreaking to read. I lost the number of times I found myself saying “Oh Gen!” — in amusement or sadness or both — as I read this book. I definitely loved the thief more in this book. Oh, and I must not forget the most surprising part of this book: the romance. I knew there was a romance, but even if I was expecting it, it still took me by surprise. I was hoping for a specific pairing up to happen, but it didn’t. I had a hard time coming to terms with it after the reveal has happened at first, but the author gave me enough time to get used to it and accept it before the book ended. And while it hasn’t really convinced me to believe that just yet, I was curious to how it would be tackled in the next book. So glad you’re finally reading these books! Yes, and there was zero indication of it, unless you count the almost-obsession with each other. I finished KoA over the weekend btw — reread some parts that proved the romance here. Heee. <3 So cute. :D I want a copy of A Conspiracy of Kings now — the problem is, if I get the hardcover, it won't be uniform with my other books. Hmf. I know, the romance. Really. This book just needs the kitchen sink. ;) LOVE Gen even more in QofA. MWT is so subtle. And so brilliant. Oh, sorry, this comment is turning into mush. Anyway, I can’t wait to hear what you think of the next book! I’m thrilled you’re reading and liking this series. I like that you’re doing the same thing I did: which is glomming onto this series after reading the first one. Seriously, it IS hard not to just go to the next book in the series, isn’t it? Deleted, but I’ll send you an email so I can reply to that. LOL. Yes, I had that problem. I just read it though. I really wanted to see what happened next! My review is forthcoming, really.